The ACR Onion shoe protects sensitive heels, increases the contact area for the rear part of the foot and limits the heel's sinking into soft ground. 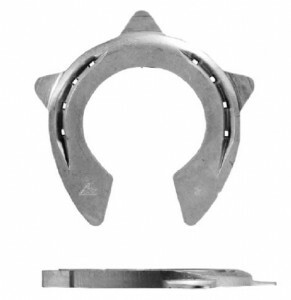 Its rolling toe facilitates breakover, spares the deep digital flexor tendon, and gives relief in the case of a podotrochlear syndrome.It is also ideal for the horses with a moderate navicular disorder that takes part in competitions (3 day events) and for horses not suited to the Egg Bar Shoe. It may be indicated for horses with navicular disorders exhibiting a lesion on the sesamoid bone or a sesamoidean ligament desmopathy. The ACR Onion Shoe 200-10 mm is available in 3x0, 2x0, 0 and 1. For the others sizes, refer to the ACR Onion Shoe 200 - 12 mm.